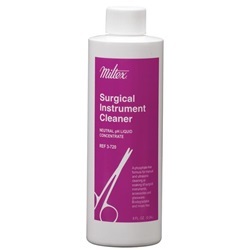 Surgical instrument liquid detergent concentrate in 8 oz. bottle. Contents of one 8 oz. bottle makes 32 gallons of solution. Neutral pH and phosphate-free liquid concentrate formula for manual and ultrasonic cleaning or soaking of surgical/dental instruments, accessories and glassware. Biodegradable and rinses free. Manufactured by Miltex.